As I arrived at the Disneyland resort, I notified both Michael and Chuck that I had arrived. Michael sent back a text saying he and his friend were just finishing Tower of Terror in Disney’s California Adventure Park and would be crossing over to Disneyland right afterwards. Chuck indicated he was on a park bench near the central hub of Disneyland. I was going to wait outside for Michael and his friend outside Disneyland when Michael sent a text saying he and his friend would be making a quick stop to the car, so I opted to go into Disneyland and meet up with Chuck and would catch up with Michael and his friend later as the trip to the car would add at least half an hour to the wait time for them. I was also playing my second round of “Wishing Stars” the fantastic GPS game that takes place in the Disneyland park and I had a couple of quests that had items on Main Street USA that I wanted to hit since I was in that part of Disneyland before I made my way down to find Chuck at the other end of Main Street. So after standing next to the items I needed to be near to collect my goals in the game, I rushed down a busy Main Street to find Chuck. Chuck had spent most of the morning going through the Fantasyland and Tomorrowland sections of the park with Flat Stanley, and he showed me some of the pictures. Probably my favorite was the one from Space Mountain where Flat Stanley was stuck onto the seat and the photo was of the ride photo that they show at the exit of the ride. Since most of the Wishing Star Items I was looking to collect were in the Adventureland/New Orleans Square section of the park and Chuck hadn’t yet gotten any Flat Stanley photos from that area of the park, we headed on down hitting both our missions. 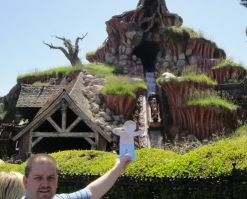 I helped out Chuck with a few photos that needed a helping hand for posing Flat Stanley in front of a few attractions such as the Tarzan Treehouse and Splash Mountain. It was funny, everywhere we pulled out Flat Stanley it seemed a mom would point and yell out “Flat Stanley” so it was good to know others were familiar with what we were doing because Chuck said he’d never heard of Flat Stanley until he was asked to help get some photos. 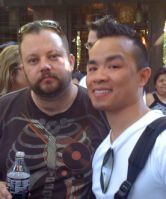 Michael introduced me to his friend Bruce Lau, who was visiting San Diego from Belgium. They had come up for the day and were enjoying the parks. They apologized for their delay of having to run to the car, and I said, no worries, I had a good time with Chuck in the meantime. And without further ado we were taking in all the fun and crazy stuff to do at Disneyland. We even suffered through a showing of Captain Eo. We had a lot of fun, on Splash Mountain, the three of us got seated at the front of the log and I’m sure the larger size of both Michael and I contributed to making the log front heavy and as a result we got incredibly soaked through the course of the ride, in fact, we were really wet even before the big plunge from some of the smaller drops inside the ride. When we got on to the big drop, I tried to keep my eyes open through it, and managed to be successful through most of it but went to blink just as we were hitting the tunnel under ride and when I opened my eyes I saw just a wall of water in front of me a mere second before that wall drenched us all from head to toe. 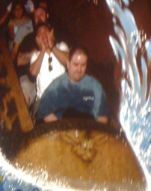 I have never in my life gotten so drenched on that ride, I quickly grabbed for my phone to make sure it was okay because I literally got covered in water. I was so drenched, it took my wallet a couple of days to dry out. We had to make a couple of attempts to get on Indiana Jones as the ride went down the first time we were in line for it. We did manage to get on pretty much everything we wanted to get on to except Big Thunder Mountain as it was shut down. We ended the day with a Fast Pass ride through Space Mountain. The line for Space Mountain was long, but the Fast Pass allowed us to bypass pretty much 90% of the line. Space Mountain is always a favorite and never disappoints. By the end of the day, still trying to dry out from Splash Mountain, and a bit hungry, Bruce, Michael, and I met up at a near by Carl’s Jr. for dinner and had another chance to chat before we made our way back to San Diego. It was a fantastic and fun day. It was great to spend the part of the day with Chuck, and then later on with Michael, and I am happy to have Bruce as a new European friend.